DO NOT GO TO TOAST FOR HAPPY HOUR. I repeat, do not go to Toast for happy hour. They do not have a happy hour special. Their bar is prohibitively small. If you show up with a large group of people for happy hour, you will be given the stink eye by management. As a matter of fact, when I ordered my charcuterie plate at the bar the server came out and gave me this little spiel about how he, "had no idea where to put my food." I explained to him that he could just put it on the bar and everything would be fine. 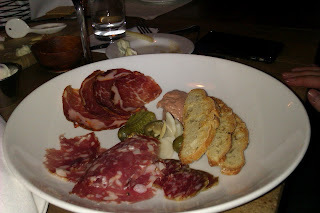 I would like to have ordered more food as I found the charcuterie excellent, but the atmosphere was simply not conducive to dining due to the size of our group. In particular, the duck pate was a real stand up act. It was probably one of the creamiest pates I've ever had with a rich sweetness that lent itself well to being spread on fresh bread. Here are my Toast pro-tips: make a reservation, do not attempt to sit at the bar, don't expect a warm welcome from the management and keep in mind that if you want to sample a wine you will be charged. Some restaurants have such good food that they don't need to worry about charming the clientele, this seems to be such an establishment - I just wish I could have tried some of the other dishes. Hmmm... I have to wonder about this. I have received nothing but gracious service there. I put an emphasis on service. If it's bad I don't return, no matter how good the food is. Admitedly Toast is a small restaurant and as such probably not a great choice for a large group, but I suspect your experience was an aberration. It's true they don't offer happy hour pricing but their wines prices, and the small taster pours they offer, are very resonable.